The executive officer of Naval Base Coronado was relieved of his duties Friday, the Navy says. “Vice Adm. William French, commander of Navy Installations Command, relieved Capt. Gregory McWherter. The decision was based on initial findings of an ongoing investigation into recent allegations of misconduct and an inappropriate command climate at the U.S. Navy Flight Demonstration Squadron (Blue Angels) based at Naval Air Station Pensacola, Fla.,” the Navy said. The allegations refer to the period when McWherter served as Blue Angels commanding officer — from November 2008 to November 2010 and again from May 2011 to November 2012. McWherter assumed his duties as Naval Base Coronado executive officer in November 2013. He has been temporarily reassigned to Naval Air Forces in San Diego. The Pensacola News Journal called McWherter the former lead pilot of the Blue Angels and that his Coronado role made him the No. 2 person on base. 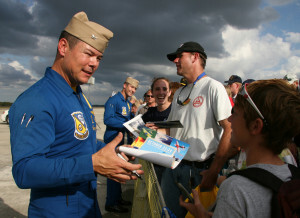 In May 2011, McWherter took over the Blue Angels after its commander voluntarily left the famed flying team after some of its jets flew at a lower altitude than allowed at a Virginia air show. “Navy Cmdr. Dave Koss announced his departure four days after the team said it was going on an indefinite safety stand-down because of the error,” The Associated Press reported at the time. Navy Times reported that McWherter, a graduate of The Citadel, has commanded Strike Fighter Squadron 192, forward deployed with Carrier Air Wing 5 in Atsugi, Japan. “During his time as CO, the squadron deployed three times on the aircraft carrier Kitty Hawk between June 2007 and July 2008,” Navy Times said.